Included in the kit: Blessing Oil, Water Vessel, Candle and Candle Holder and, the Blessing Prayer with instructions. 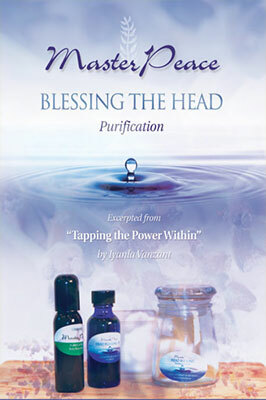 As a special gift, you will also receive a sample of MasterPeace Purification Body Wash to be used prior to your head blessing. No one else can do or learn what you need to know. Even when you have a negative thought, it is because you have to learn a particular lesson. In the process of lifelong learning, you must also learn to trust your head. The greatest resistance to our own thoughts is fear. We are taught not to trust ourselves. Consequently, when we have a negative thought, we do not believe it is good. Because so many of us live in fear, we usually resist what our head tells us to do, in fear of displeasing someone else. Also, our fear of change, failure, the unknown and loneliness allows us to resist the very acts which are necessary for our growth and evolution. One simple way to overcome this challenge is to bless our heads, daily or weekly. The Head Blessing Kit includes everything you need to perform this sacred and powerful ceremony for yourself. I loved the affirmations, the blessings for each part of me. I bought this for my nieces pre wedding altar. I am buying another for my home. Good for morning practice. Thankful.